Some of these are really OLD friend and some are fairly “new” like Sherlock Homes there on the left and “The Hound of the Baskervilles”. That’s a new book, not a new story. I’ve probably read it three times. Right next to it is my first “reader”: “Cubby in Wonderland” by Frances Joyce Farnsworth, published in 1932. It was my dad’s and he gave it to me when I was just learning to read. I treasure that book! It’s about the adventures of a black bear cub in Yellowstone Park. “Of Mice & Men” by John Steinbeck – not his best but certainly his weirdest. That’s a sad story. Next to it rests “The Three Musketeers” by Dumas and I can’t even say I’ve ever actually read it. I’ve seen the movie several times. Time to put it on my “read” list! 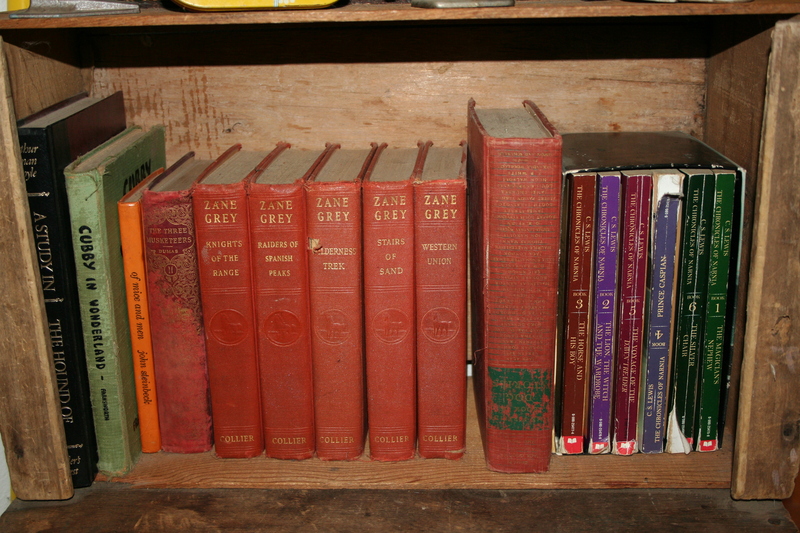 Several Zane Grey novels: “Knights of the Range”, “Raiders of Spanish Peaks”, “Wilderness Trek”, “Stairs of Sand” and “Western Union”. Hmmm: there’s a gap there and “Riders of the Purple Sage is missing. ARWEN! “The Book of Dog Stories” is next and I can’t say as I’ve ever read much of it, either (it is also upside-down in the book case). 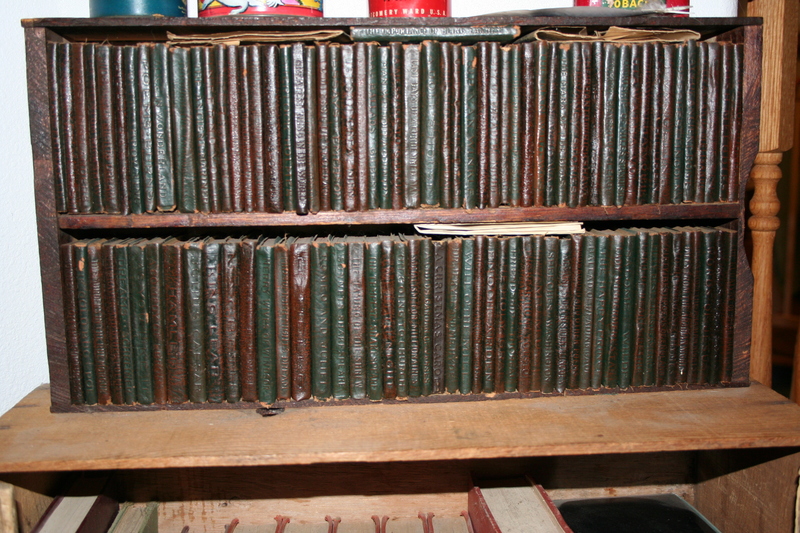 The dog-eared collection of C.S. Lewis’ “chronicles of Narnia” belongs to Arwen. I’ve only actually read the first one: “The Lion, The Witch & The Wardrobe”. More goodies: “The Prophet” by Khalil Gibran. “100 American Poems” (which includes “The Whore in the Snow Bank” and many poems by that great American poet, Anonymous). “Selected Poems” by Whittier and “The Courtship of Miles Standish” by Longfellow. “Poetic Meter & Form”. “Addison’s Sir Roger de Coverly”. I confess I have only read part of the latter book. Next to those two lies “The Book of Courtly Love” which is mostly Shakespearean love sonnets, a gift from my husband on some long-ago wedding anniversary. “Norton’s Anthology of Poetry” from my one year in college, 1974-75. It is dog-eared and tattered but I treasure it. “A Farmer’s Heaven” is a self-published book by Myron Burrell Bybee who was a friend of my father’s. It, too, is a collection of poem, all by Myron. Why is “Remembrances from a Mother’s Heart” on this shelf? Hm. that’s one of those fill-in-the-blanks journals for your kids to look at after you die. I probably have it 2/3’s finished then shelved it and forgot about it! But it is in good company because the one right next to it: “On Being A Mother” is the very same thing but a different format. “Winged Arrow’s Medicine” by Castlemon has a publication date of 1901. I’ve never read it. I just picked it up at a yard sale because of the condition and age of the book. It’s a YA novel for boys. “The Second Jungle Book” by Kipling was my favorite book in the 4th grade. I loved anything by Rudyard Kipling that year. “The Adventures of Arnold Adair, American Ace” by Laurence Driggs (1918) and “Bob, Son of Battle” by Alfred Ollivam (1898) are on my shelf for the same reason as”Winged Arrow’s medicine is: age and quality of the book. I’m a sucker for good quality antique books. I haven’t actually read them (yet). The leather mini-books that belonged to my grandmother Sylvia Cusick Wilcox. A random sampling of titles includes “Poems – Burns”, “Alice in Wonderland”, “Speeches of Washington”, “A Christmas Carol”, “The Taming of the Shrew”, “Merry Wives of Windsor”, “Julius Caesar”, and “Arabian Nights”. They are in their original box and the little pieces of paper tucked in there are carbon-copies of a typed list that my grandmother made of all the books in her collection. I could not have picked a better book shelf to photograph than this one. Some of these books are old, old favorites and provide a true picture into my heart. How many of them have you read? 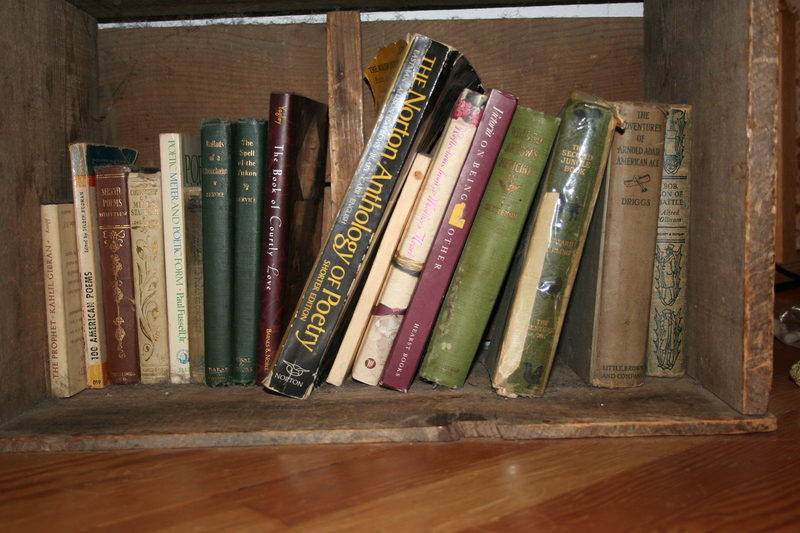 Do you collect old books? And does anyone(Arwen! <ahem>) know where my copy of “Riders of the Purple Sage” is? Hmmmm….wonder why the song “My Favorite Things” is now cruising through my brain? I thought you had Don Quixote too? I have many, many books, but not a large collection of old books. Some close friends of ours recently decided to give up on the north and moved to southern B.C., and before they left they gave me their entire personal collection of out-of-print northern hardcovers. I offered to pay for them, but they wouldn’t accept any money. I was very blessed. If you have never read “Tisha”, by Anne Hobbs Purdy, treat yourself. It’s a true story and an Alaskan classic. I’ve read that one several times, and will read it again.